Put ghee to warm in a heavy pan. Add flour, rava, stirfry on lowflame, stirring continuously with a spatula. This step takes time, so do not roast on high flame, end result will not be good. When flour is golden brown and aroma exudes, take off fire. Add milk, run in a mixie for a few seconds till well mixed. Cool, add sugar, cardamom, essence, mix well. 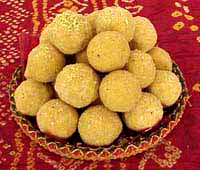 Shape into laddoos of desired shape. Cool completely, before storing in airtight container.